I know, I know, there’s lots of discussion out there already about the relative brokenness of Civilization V. I’ve logged more than 90 hours now in Civ 5 (if Steam is to be believed) and picked up the expansion packs over Thanksgiving weekend hoping that some of the basic problems with Civ 5 were resolved. The expansion packs are fun, but the core problems with Civ 5 still remain. They’re problems of narrative. Here’s the first problem: If you’re doing well, the game gets easier. The amount of territory you control, riches you possess, and technology you’ve mastered are all indicators of how well you’re playing the game. If you’re leading the pack with a large, prosperous, powerful and technologically-advanced civilization, you’ve demonstrated mastery of the game so far. In any other video game, that’s where you would graduate to the next level and be presented with more difficult challenges, all of them leading up to a final confrontation. But in Civ 5, that doesn’t happen. The only thing that happens when you do well is . . . the game gets easier. This puts an inordinate amount of pressure on the early stages of the game. Usually I either come out of the Ancient era flushed will the thrill of conquest and then coast on to a lazy victory over the next 4,000 years, or I come out of it marginalized and weak only to get trounced later on down the line by some jerk with tanks. To describe it in narrative terms, it’s as if the hero in a story faced their most dangerous challenge right at the beginning, beat it, and then farted around for the next 500 pages. Not very compelling, eh? No wonder so many of my Civ 5 games go unfinished . . .
Looks fair . . .
Here’s the other problem: given the same resources, you will never be able to compete with the AI opponents economically. Their bonuses are set so game-breakingly high on even moderate difficulties that they will always out-produce you to a disheartening degree. They’re playing on the same field but with a different set of rules–it’s as if two teams were playing football, except one of them got to put 30 guys on the field to face the other’s 13. 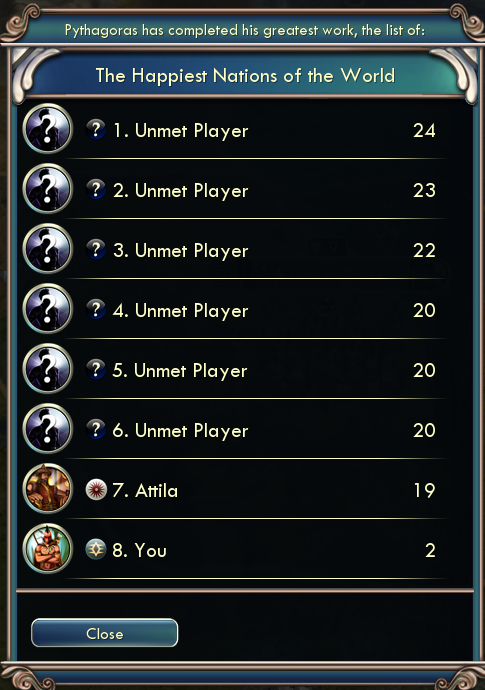 The sad part is that you can still beat them, because the AI in Civ5 is friggin’ dumb. They really don’t know how to handle the one-unit-per-hex combat, and their foreign policy choices are irrational at best. An ideal AI opponent would use their resources more effectively as the difficulty level was increased, but the Civ 5 AI just gets increasingly large amounts of production that appears by magic. It’s more and more jarring with each level of difficulty. There’s a rule about world-creation, and it goes like this: your world has to follow it’s own rules. If it doesn’t, it’s jarring to the audience. Each infraction is a zipper in the costumer, a peek at the man behind the curtain, an ounce of immersion irrevocably lost. And when you have too many of these breaks, your audience stops buying it. It’s hard for me to picture myself as a benevolent world leader, guiding his people to glory, when money keeps appearing out of thin air in my competitor’s cities and their populations live in a state of permanent, unnatural euphoria. That’s actually a really creepy image, now that I think about it. What do you think? Am I playing the game wrong? Comment below, or subscribe over there to the right . . .